LinkedIn launches new tool for smartphone: Intro LinkedIn. It allows, in an exchange of e-mails on mobile, to get more information account of its contacts (business, job, website ...), just drop a tab. Practice. LinkedIn has introduced new versions of its mobile applications with a new tool called LinkedIn Intro. It unfortunately address to users of iOS, connecting to the Mail utility. LinkedIn Intro to send or receive emails with details of the (s) information contact (s): position, company, address, website ... all in the form of a tab in place. 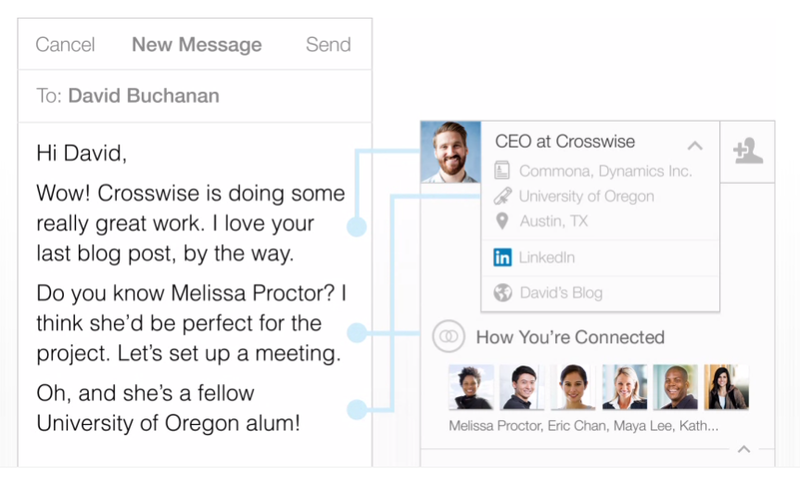 This new tool allows not to waste time and immediately relocate her LinkedIn contacts while having its range of information at your fingertips. This innovation follows the acquisition of the company by Rapportive LinkedIn in 2012: the company developed this kind of solution in Outlook and Gmail. At present, about 50% of the mails are accessed via smartphones it seems imperative for the professional social network to strengthen its offering for mobile.